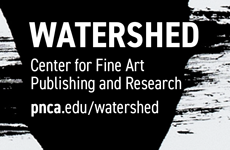 A new etching published by RISD Editions. New screenprints from Advanced Graphics London. Grant D. Taylor writes about Vera Molnár. Catherine Daunt reviews the Anni Albers retrospectives at Tate Modern and Alan Cristea in London. Fig. 1. 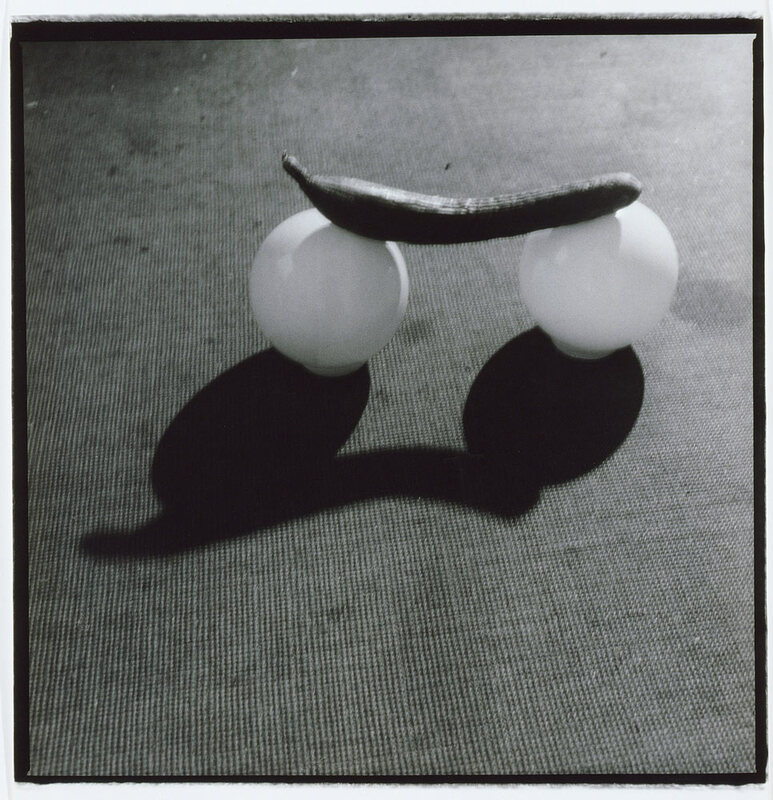 Sigmar Polke, Untitled (1964-68/90), gelatin silver print, 23.7 x 19.8 inches. Courtesy Leo Koenig Inc., New York. Sigmar Polke was an artist of cultivated irreverence—a provocateur, a born boundary pusher. When it came to photography his eagerness to flout the familiar found expression through the printing process than through any particulars of what he was shooting. The vivacity of his photographs derives as much—if not more—from Polke’s darkroom techniques as it does from any of the subjects he chose to frame. Polke’s photographs stand out as battered things, mussed up mightily in the course of experimentation he carried out in the makeshift darkrooms where he worked. Many of the prints have ripped or fraying edges, chemical stains are ubiquitous, heavy creases form ditches that run through a number of images. The various surface textures imbue the prints with a tactile, even painterly, quality. Polke was never just working with the image; he was always working on the object. 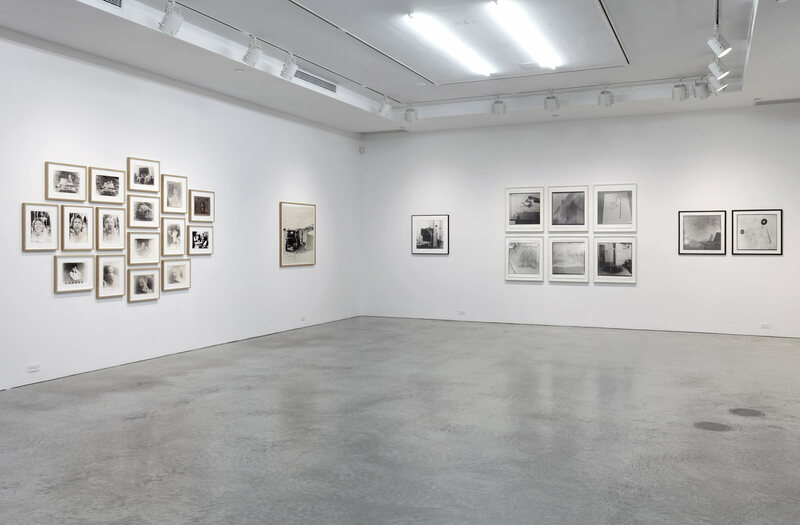 The array of photographs accumulated for this exhibition was impressive—they dated from the sixties, seventies, and late eighties, though none was more recent than 1990. Ironically the youngest photographs came from the oldest negatives. These black and white images show Polke cracking wit like a Dadaist: a teakettle pours a handkerchief into a cup, a rug “keeps folding itself into a woman,” a cucumber balances on a pair of eggs (Fig. 1), in another it pokes through a scrap of fabric in what appears to be the porcelain of a tub. Polke was in his early twenties when he made these playful photographs, the absurdity of which already foretells of the delight Polke would take in mocking art-world orthodoxies such as the still life. Sigmar Polke, Untitled (Palermo) (1976), gelatin silver print, 32 3/4 x 29 1/2 inches. Courtesy Leo Koenig Inc., New York. A similar taste for silliness carries through in the 1968 portfolio Higher Beings Command—fourteen photolithographs formatted in the didactic manner of a scientific study. The sober presentation is undone by the contents: more than half of the images are goofy representations of palm trees using household items like buttons, cotton, or wool. In one, the artist stands nearly naked, holding five or six large cuts of paper that arc towards the floor; a “person palm” (Meschenpalme) according to its printed caption. In the seventies Polke started traveling abroad and his photographs became more straightforwardly documentary. Scenes from Paris, Pakistan, and Palermo show Polke visiting locales such as bear fights and crypts. At the same time Polke was taking LSD with increasing frequency, and the consequences are apparent in his printing process. Images left unfixed became over-developed, negatives were double printed or only partially printed on single sheets of paper. (Really, who knows what Polke saw emerge in those chemical baths?) What other photographers would have considered mistakes delighted Polke; he relished accidents and courted serendipity as if he was constantly rediscovering how to print his images. Polke’s is an empirical art with a correspondingly visceral impact. At their best, his photographs do what great art does—they represent a subject by embodying its essence in the art object. 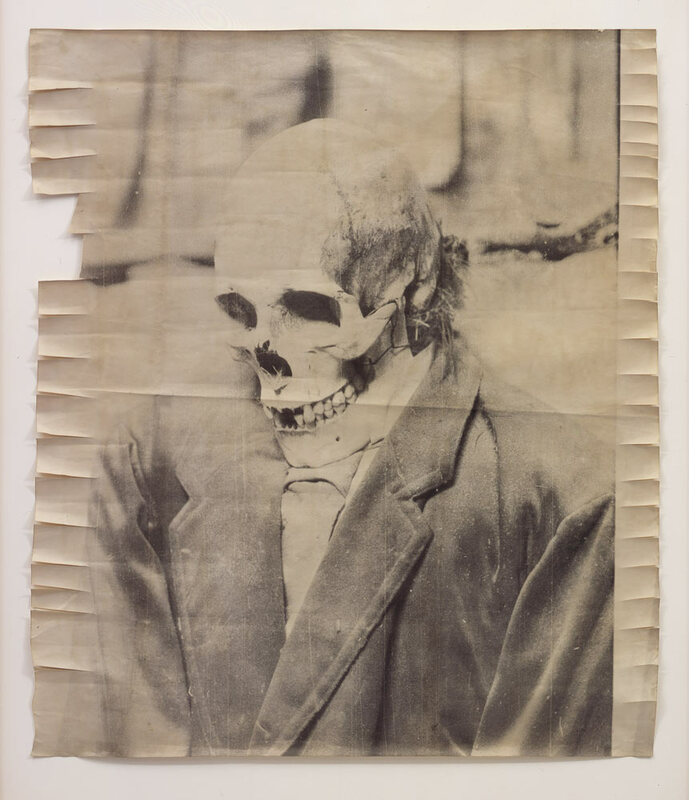 Consider the series shot in the crypts of Palermo: not only do they depict skeletons, the photographs themselves appear to be decaying with age. Their tattered look echoes the shabby outfits worn by the skeletons. Additionally, both a crypt and a camera are instruments of preservation, but here the skeletons seem to be on display—representations of death—and that is precisely what Polke’s photographs do too. The camera is not being used an as indexical tool; it is enlisted in the service of emotive affect. The photographs do not merely record the reality of a crypt, they actualize the truth of what’s going on there: decay and display. 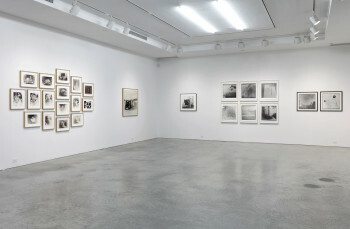 Installation view, courtesy Leo Koenig Inc., New York. There is some irony then to the very conventional, rule-abiding manner in which these defiantly unconventional, irregular and irrational photographs were displayed: all neatly framed and arranged in categorical groups: on one wall were the skeletons, on another photos of friends, on another cucumbers, etc. In the 1990s Polke’s photoworks were the subject of two significant retrospectives, one organized by the Staatliche Kunsthalle Baden-Baden in 1990 and another by the LA MOCA in 1996. Both were sprawling exhibitions, in which Polke employed cut-and-dried presentations not dissimilar to that at Leo Koenig (though in seriously larger doses). Snapshots of Polke’s contribution to Documenta 6 in 1977 reveal a far less conventional approach. A significant part of Polke’s legacy is his ambivalence—even hostility—towards art world norms and it is disheartening to imagine that spirit waning. Fortunately his photographs are powerful enough to carry that legacy forward, no matter how they are framed.